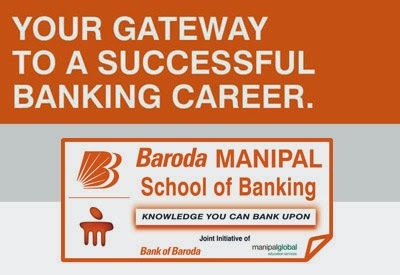 Bank of Baroda (BoB) has issued recruitment notification 2015 for 1200 post of Probationary Officer (PO) posts in Junior Management Grade/ Scale-I through Manipal school of banking. Willing contenders may fill online application form on or before 17th March, 2015. Educational Qualification : Candidates should have completed Degree (Graduation) with min. 60% marks (55% for SC/ ST/ PWD) marks in any discipline from a recognized University OR any equivalent qualification as such recognized by Central Government. Age Limit : Candidates must have attained the age of 20 years but not crossed the age of 28 years as on 17th March, 2015 , i.e must have been born not earlier than 18-03-1987 and not later than 17-03-1995 (both dates inclusive). Application Fee: Rs. 600 for Gen/OBC, Rs. 100 for SC/ST/PWD candidates. Selection Process : Selection will be done on the basis of performance in Online Exam followed by Group Discussion & Interview. How to Apply : Interested Candidates can register their application form through Online website www.bankofbaroda.com on or before 17th March 2015.